Should I get my coin collection appraised? Although the notion of a three-cent piece strikes us as strange today, in 1851 the denomination actually seemed like a good idea to members of Congress and even to members of the public. It did serve a purpose for a time. The impetus for this coin, the smallest ever issued by Uncle Sam in terms of weight and thickness, was twofold. It was “fathered,” so to speak, by the California Gold Rush and “mothered” by the nation’s postal system. Following the discovery of gold at Sutter’s Mill in 1848, thousands of fortune-seekers swarmed to California. The “Forty-Niners” and others who followed them mined enormous quantities of gold. That, in turn, had a direct impact on U.S. coinage: The massive new supplies of gold depressed that metal’s value in relation to silver, leading to widespread hoarding of silver coins. Put another way, a rapid rise occurred in the price of silver, as figured in gold dollars. It became profitable to hoard and melt silver coins, since they were worth more as metal than as money. Conversely, hardly anyone was bringing newly mined silver to the Mint for conversion into coinage, as had been the practice up to then. That helped limit production, further restricting supplies of silver coins. By 1851, hardly any silver coins remained in circulation, creating a real problem for merchants and their customers. 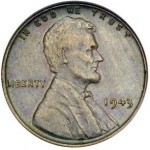 The only coins available for making change in amounts less than a dollar were copper large cents and half cents, which most people found extremely inconvenient; there wasn’t even a “nickel” as we know it today, since the five-cent coin in use at the time was the silver half dime. As luck would have it, federal officials were then in the midst of reducing the basic prepaid postal rate from five cents to three cents. Sen. Daniel Stevens Dickinson of New York concluded, logically enough, that a three-cent coin would be a useful way to purchase stamps. At that time, most Americans were uncomfortable with the notion of fiat money (money worth substantially less intrinsically than its face value) so they surely would have rejected a base-metal three-cent piece with only, say, a cent’s worth of copper. On the other hand, a precious-metal coin made from the alloy then being used in existing silver coins (90-percent silver and 10-percent copper) might have been subject to the same kind of hoarding and melting. Dickinson and his allies hit upon a compromise: a three-cent coin with enough precious metal to avoid being thought of as fiat money but not enough to draw the interest of hoarders. The alloy they selected was 75-percent silver and 25-percent copper (or debased precious metal). This proposal became law as the Act of March 3, 1851, taking effect June 30 of that year. The job of designing the coin fell to James Barton Longacre, who had become the Mint’s chief engraver seven years earlier. Its small size made his job extremely difficult. Even allowing for that, few have ever found this coin artistically compelling. Its obverse depicts a nationalistic shield superimposed upon a six-pointed star. This is encircled by the inscription UNITED STATES OF AMERICA and the date. 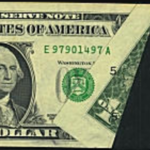 The reverse bears the statement of value in the form of the Roman numeral III within a stylized, beaded “C.” Thirteen stars along the reverse border complete the design. According to the late Walter Breen, a renowned numismatic scholar and researcher, four proof specimens of the 1851 silver three-cent piece were made, evidently struck to celebrate the coin’s inception. Reportedly, a single proof example of 1852 exists in the collection of the American Numismatic Society in New York City. In 1853, Congress passed legislation reducing the weight (and thus the silver content) of the half dollar, quarter, dime and half dime. 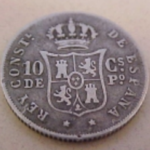 This had the desired effect of discouraging further hoarding and reestablishing all these silver coins in circulation. 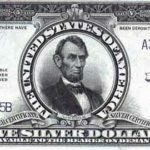 That same year, it authorized an increase in the fineness of the three-cent piece up to 90 percent, bringing it in line with the other silver coins, and a simultaneous one-twentieth-of-a-gram cutback in its weight, keeping it below the point where melting would be profitable. 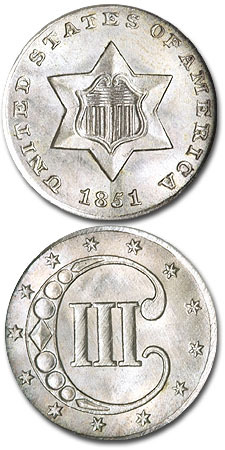 These “Type 2” three-cent pieces didn’t appear until 1854, after Longacre modified the original design, making it easier to detect the new issues. Among other things, they have two extra outer rims around the star for a total of three. 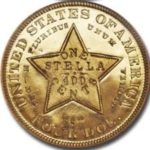 In 1859, further tinkering occurred to correct striking problems, and from then through the end of the series in 1873 the “Type 3” issue had only two rims around the star. Because the Type 1 “trime” comes in only four date-and-mint varieties, it could easily be collected in that fashion. Many prefer to set aside just one high-grade example, however, as part of a type set also including one example apiece of the other two types in this series. Although their initial popularity quickly waned, most of the early trimes saw extensive use in circulation. As a result, high-grade mintstate specimens are extremely scarce, especially in levels of MS-66 and above. Places to check for wear include the points of the star and the high parts of the Roman numeral III. Weak striking is common with this issue and should not be mistaken for wear. PHOTO PROOF – Copyright © 1994-2014 Numismatic Guaranty Corporation. All rights reserved. Is my 1957 Douglas Dillon $1.00 silver certificate worth $5000?